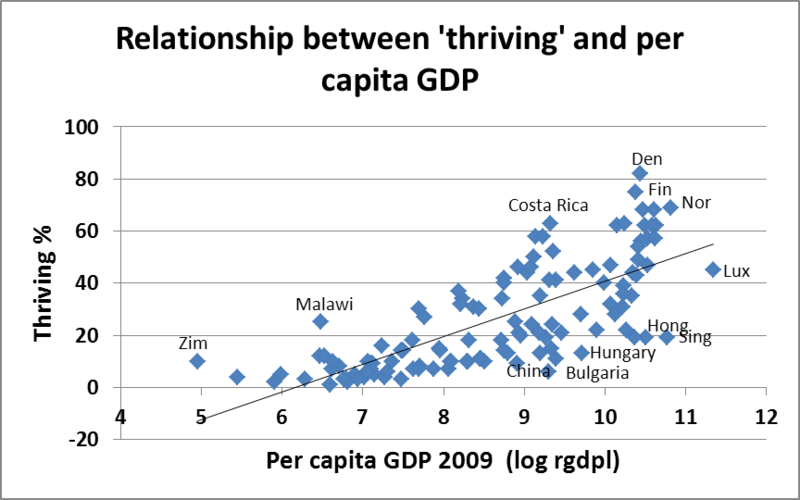 Freedom and Flourishing: Does economic growth help people to thrive? Yes! The proportion of people who are thriving tends to be higher in countries that have experienced greatest economic growth over the longer term. It may take several decades, however, for economic growth to be fully reflected in subjective measures of well-being. 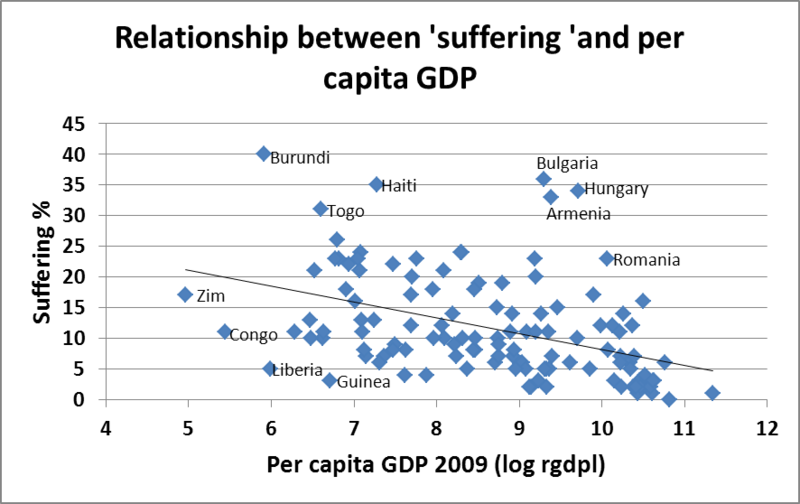 The proportion of people who are suffering also tends to be lower in countries that have experienced greatest economic growth, but there are quite a few countries that do not fit that pattern. These observations are based on the definitions of ‘thriving’ and ‘suffering’ used in the Gallup World Poll. Gallup classifies respondents as "thriving," "struggling," or "suffering," according to how they rate their current and future lives on a ladder scale, based on the Cantril Self-Anchoring Striving Scale, where the bottom rating is ‘the worst possible life’ and the top rating is ‘the best possible life’. Further information on the survey and classification method is available here. The following charts show the percentages of people who are thriving or suffering in 122 countries relative to per capita GDP levels in those countries. It is clear that the percentages thriving tend to be higher and the percentages suffering to be lower, in countries with relatively high per capita incomes i.e. those which have experienced greatest economic growth in the past. The countries that do not fit the general pattern are interesting. Several former communist bloc countries are outliers in terms of lower percentages of the population thriving and a higher percentages suffering than would be expected on the basis of per capita income levels. Some African countries have much better outcomes and some much worse than would be expected on the basis of income levels. The outcomes that are worse than expected can be explained by factors such as civil unrest. Better than expected outcomes for African and Latin American countries in studies such as this are often attributed to national characteristics, such as a positive outlook on life (but that is not necessarily irrelevant to emotional well-being). The lower than expected percentages of people thriving in China, Singapore, Hong Kong and Taiwan might also be attributable to some extent to a more reserved outlook on life by Chinese people. It would be appropriate to round off this discussion with a profound statement stressing the importance of economic growth to reducing human suffering and allowing more people to thrive, while acknowledging that wealth does not guarantee that anyone will thrive. However, I’m not in the right mood for writing profound statements. Thanks for another nice post. Liked your last sentence, too! I appreciate your comments, Dave.